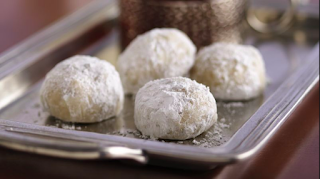 Some people call these Russian Tea Cakes or Mexican Wedding Cookies, but at my house we call them Irish Christmas Tea Cakes. Everyone loves them. 1 Heat oven to 400ºF. 2 Mix butter, 1/2 cup powdered sugar and the vanilla in large bowl. Stir in flour, nuts and salt until dough holds together. 3 Shape dough into 1-inch balls. Place about 1 inch apart on ungreased cookie sheet. 4 Bake 10 to 12 minutes or until set but not brown. Remove from cookie sheet. Cool slightly on wire rack. 5 Roll warm cookies in powdered sugar; cool on wire rack. Roll in powdered sugar again.